The Flour Factory is on Queen Street in the CBD, in the space previously occupied by Venn Bar + Cafe, where I had pretty good scrambled eggs for breakfast on my birthday last year. 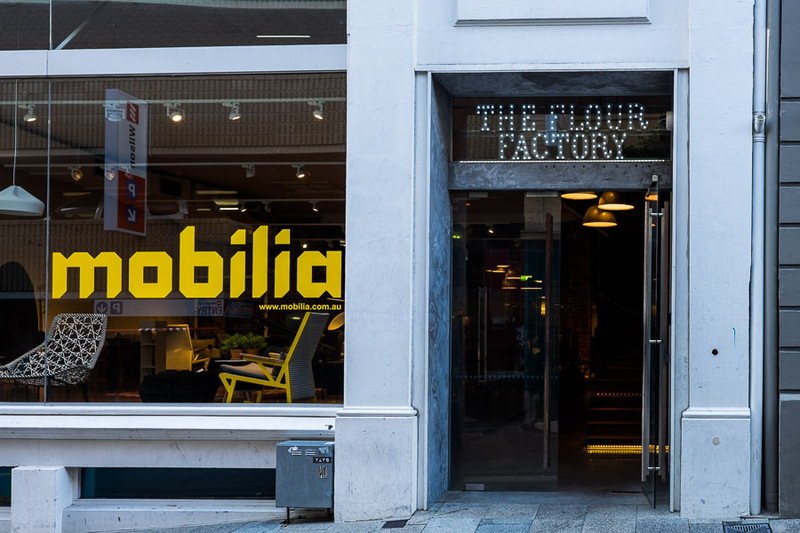 The ‘Flour Factory’ name is a tribute to the building’s past life as a flour mill established more than a century ago. The Flour Factory combines hotdogs, charcuterie and bakery, with a recently launched rooftop bar called The Sherry. The place opens early (7am) on weekdays and I had the opportunity to drop in for breakfast on Thursday and Friday mornings last week before attending training courses in the city. 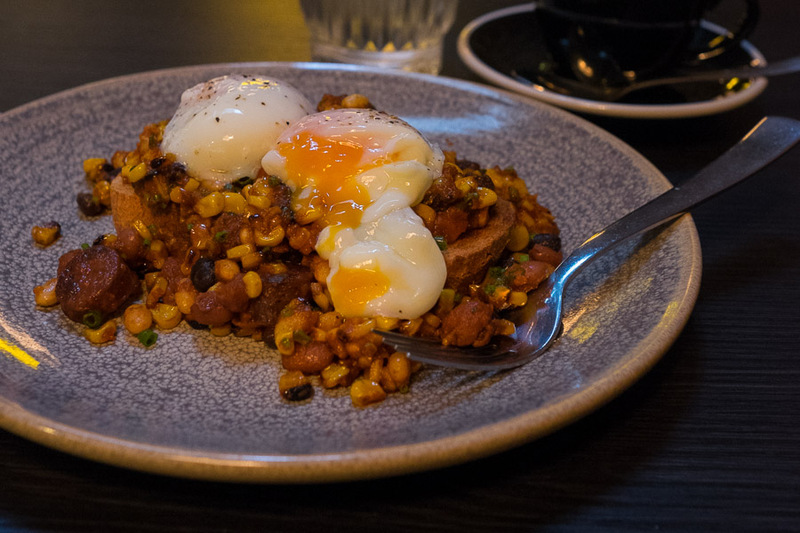 My Thursday dish was a cracker: 63 degree eggs, charred corn, chorizo and beans. 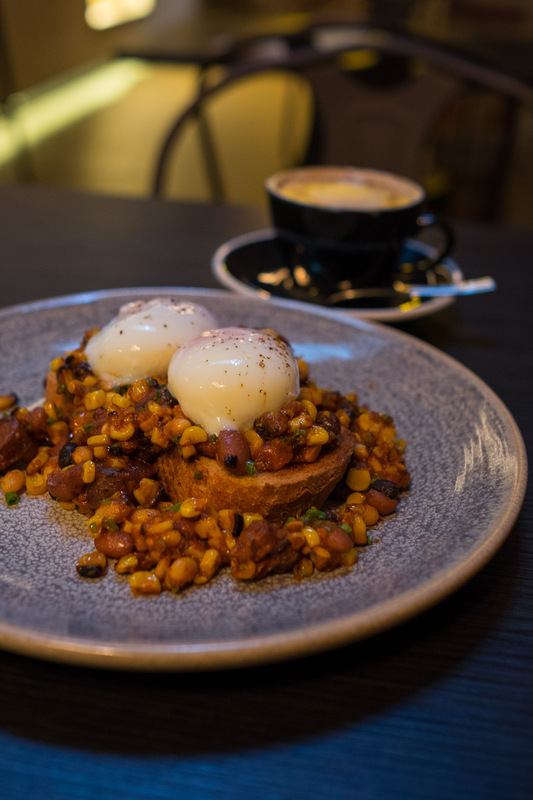 Vibrant flavours and abundant pleasures for a texture junkie – the pop of corn, chewy chunks of sausage, those wobbly-like-jelly slow cooked eggs and a slab of toast for soaking and mopping up. My Friday dish was less successful. 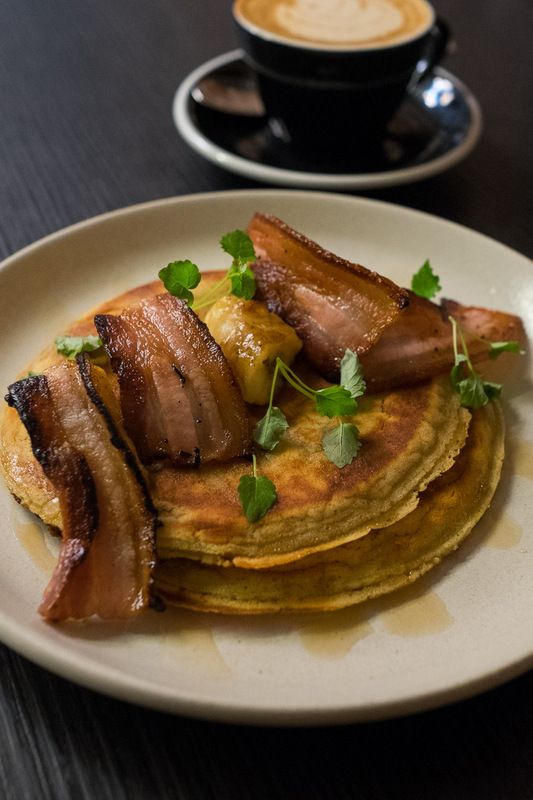 The fluffy pancakes and soft caramelised banana were let down by rindy bacon. It’s rare for bacon to be the worst thing on the plate, but sadly, here it was. Friday’s coffee was just like Thursday’s: bitter and foamy with blotchy crema. 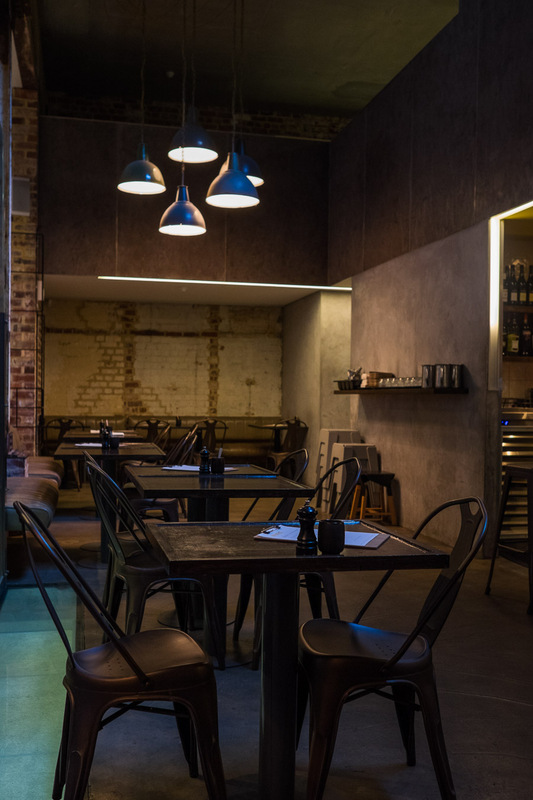 Although I’ll be reluctant to order bacon or coffee again at The Flour Factory, I am still keen to try the hotdogs and charcuterie (cured lamb belly served with house pickles and bread sounds terrific) – I hope to return for lunch or dinner. The breakfast menu (which isn’t included on The Flour Factory’s website) includes eggs (fried, poached, scrambled or 63 degree) on toast, a big breakfast fry-up and pancakes with berries and whipped cream, but besides what I ordered, dishes that really caught my eye were (interestingly, vegetarian): mushrooms, asparagus, hazelnut and egg yolk dressing on toast; and avocado, grilled tomato, feta, wattle seed and lemon myrtle honey on toast. 63 degree eggs, charred corn, chorizo and beans. These really were fantastic eggs. Pancakes with banana and the tragedy of unsatisfying bacon (AU$15). There are bakery treats on the front counter each day. 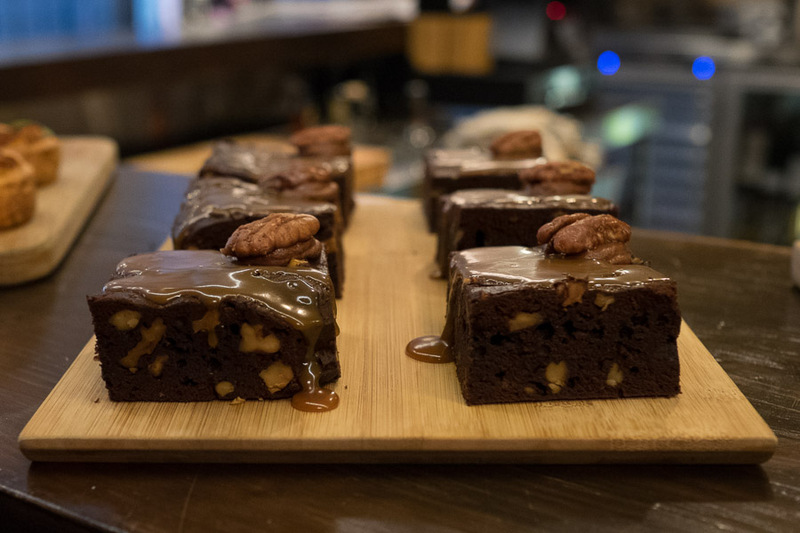 These brownies with walnuts, pecans and salted caramel looked pretty good, but alas – no maclairs (a macaron-eclair hybrid, a specialty of The Flour Factory) or bacon pretzel salted caramel doughnuts. Even after a hearty breakfast, I’d have found room for either of those. 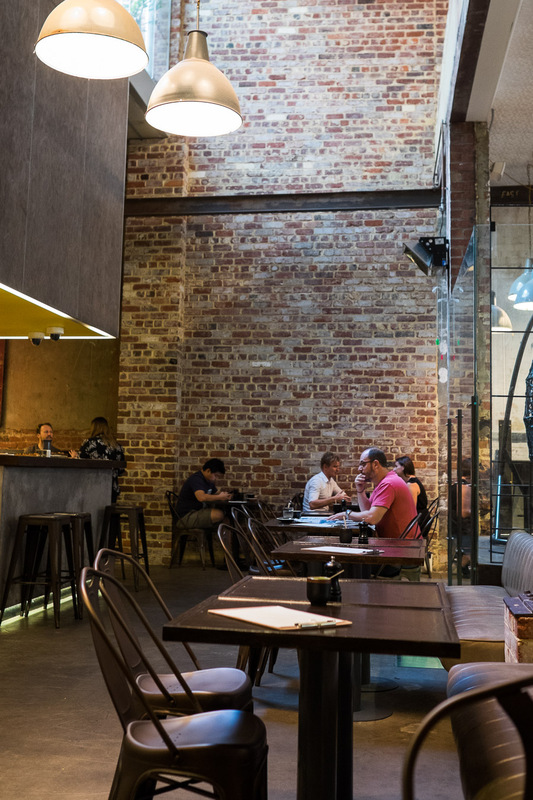 The place has the exposed brick look that’s become typical of Perth bars and cafes – history meets modern industry, rough meets smooth – with (thankfully) comfortable chairs. If the coffee had been better, I’d have ordered a second cup on both days. The Flour Factory entrance on Queen Street.